The Astir Palace is located on the elegant "Vouliagmeni" area just 25 km from the centre of Athens and 24 km from the International airport "Eleftherios Venizelos". The complex's prime location is convenient for reaching the cosmopolitan city centre of Athens, enjoying all the privileges services of a modern city and its cultural heritage, Acropolis, and Olympic stadium, the exclusive shopping district and elite spot Glyfada. The hotel's surrounding areas offer a wide range of excursions and attractions nearby archaeological temples, Cape Sounio and atmospheric landscapes. Also, the hotel's surrounding areas offer a wide range of excursions and attractions, nearby archaeological temples (Cape Sounio) and atmospheric landscapes. Driving along the coastal road of "Posidonos", a beautiful coastline, you will pass by the beautiful beaches of Glyfada, Vouliagmeni and Varkiza. The ultimate place for sailboats, yachting, sunshine and blue seas. Guests stay in Astir Palace resort enjoy the most privileged and splendid view of the Saronic Gulf. The first “star” of the Astir Palace Vouliagmeni Hotel Complex, Arion Resort & Spa, exhales the prestige of the classical style in combination with the charm of the contemporary style. These two dominant elements, the classic and the modern, are harmonically combined, exalting it into Attica’s foremost exclusive hotel. Deluxe rooms are approximate- 26 m² and enjoy sea or garden view. These rooms feature contemporary but elegant style furnishing and decor and include luxurious in-room and bath amenities. Bedding type: King size. Grand Deluxe Rooms provide every comfort for both leisure and business travelers. Gentle color combinations with emphasis on earthly colors, hand-picked textiles, materials and furniture, cosmetics from famous houses, well thought-out lighting that fluctuates according to your personal needs and other elegant details offer the ultimate relaxation in accommodation. Grand Deluxe rooms are available with sea or Garden view. Available bedding type: twin or king-size. The comfort and the discreet luxury that characterizes all areas of the Arion Resort & Spa are equally found in their suites. The furnishings and decoration in all these integrated apartments carry the seal of famous signatures. The journey begins by opening the double silk curtains that decorate the windows, letting the blue color of the Saronic Gulf inundate your senses and your accommodation area. Deluxe suites 54m² feature king-size bed, exceptional office furniture and comfortable couch, spacious bathrooms with steam bath, double sinks etc. Located on the VIP Executive floor, 4th level, - Excelsior Club, Excelsior rooms & suites offer the ultimate in luxury, privacy, comfort and calmness. Excelsior Deluxe rooms are 41m² and designed to provide exceptional standards of comfort for both business and leisure visitors.. The Spacious and elegant rooms include a sitting-room that complements the styling of the bedroom and together they create a rich and graceful atmosphere. 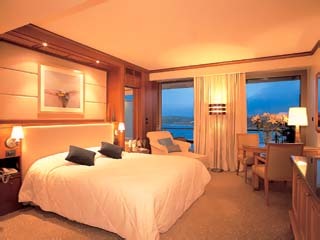 Excelsior deluxe rooms overlook the Saronic Gulf and are furnished with King-size beds. They have spacious seating room available that includes working desk, charming seats. These traditional features are skillfully combined with the provision of the most modern facilities, including ISDN lines, modem points, voice mail and interactive TV. Stepping into the Excelsior Deluxe Suite is an experience in itself. A very generous 55 m² of space that serves to enhance the majestic ambience of graceful living that is the trademark of this type of accommodation. All Excelsior Deluxe suites feature king-size beds, entrance halls, rich carpets, unique and elegant furnishings, beautiful separated seating area, luxurious and modern amenities at every turn, marble bathrooms, with steam bath, and spacious balconies that afford spectacular views. Indulge your self into 82 m² of classical style allied with luxurious atmosphere and stunning views of the Saronic. The Ambassador Suite of the Arion Resort & Spa is located on the 3rd floor and features unique and elegant furnishings of famous signatures, superb décor, rich carpets in earthly colors, hand-picked textiles, all modern facilities and luxurious amenities, marble bathrooms, with steam bath with private sauna, private balcony. Astir Palace offers a great choice of hotel services and facilities to meet the needs of both leisure and Business travelers. Combining premier services, an endless selection of amenities and exceptional views of Saronic Gulf, Astir Palace Vouliagmeni creates a luxurious retreat that goes beyond expectations. Astir Palace with a tradition in exquisite and imaginative cuisine, introduces a new world of distinctive dining experiences that will indulge your senses. Guests can enjoy creative gourmet fare and attentive personal service at any of the resort seven restaurants ranging from the Club House the hotel's signature gourmet restaurant to Taverna 37 a Greek traditional tavern by the beach. Location: 20 meters to the right of the Main Gate of the Hotel Complex. Located at the lower level of Arion Resort & Spa, the Gourmet Grill Room, seasonal, serves modern International cuisine accompanied by high level of service. The private dining area of the restaurant Le Prrive is the ideal place for dining events of 10 people who wish to enjoy its exceptional cuisine in a more private setting. The Wine Cellar of the restaurant features selective wine lists from Greek and International wines ideal for lovers of good taste in all aspects of life. Casual but elegant all-day Restaurant offering dishes from international cuisine in a luxurious and pleasant atmosphere. With the freshness and the atmosphere of Greek traditional tavern, seasonal, Greek grilled dishes are in charge, always accompanied with fresh salads, ouzo and beer by the beach of Arion Resort & Spa. Taverna 37 is ideal for enjoying a perfect day by the beach. All that is required for a simple private dinner, a corporate lunch, a celebrating occasion or any other private occasions can be found in the luxurious venues of Astir Palace Hotels. Astir Palace offers a variety of atmospheric bars and lounges for your total relaxation, entertainment or business meeting. Enjoy your favorite drink or cocktail in one of the seven exceptional bars by the sounds of lounge music or live piano and magnificent views. The lounge Bar of Arion Resort & Spa serves refreshing drinks and cocktails. Beach bar offering drinks and light snacks by the private beach of Arion Resort & Spa. Pool bar at Arion Resort & Spa, The Westin Athens and Aphrodite pool area serving refreshments, fresh orange juices, and a selection of the Bartender's special cocktails. Modern lounge bar located at the lower lever of The Westin Athens, featuring cocktails and drinks by the sound of relaxing music sounds.